Flow cytometric analysis of TF-1 cells (blue) and KARPAS-299 cells (green) using ALK (D5F3®) XP® Rabbit mAb (Alexa Fluor® 700 Conjugate). Cell Line Source: Dr Abraham Karpas at the University of Cambridge. 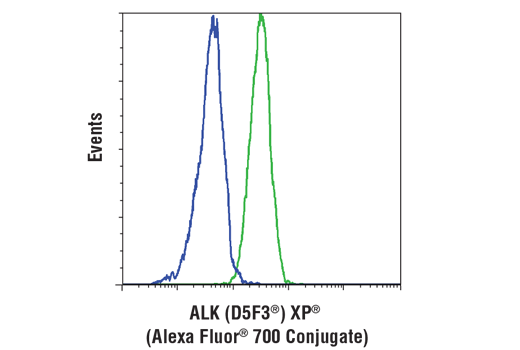 ALK (D5F3®) XP® Rabbit mAb (Alexa Fluor® 700 Conjugate) detects endogenous levels of total ALK protein as well as ALK fusion proteins, such as EML4-ALK variants and NPM-ALK, even at low levels. This antibody does not cross-react with other family members. This Cell Signaling Technology antibody is conjugated to Alexa Fluor® 700 fluorescent dye and tested in-house for direct flow cytometric analysis in human cells. This antibody is expected to exhibit the same species cross-reactivity as the unconjugated ALK (D5F3®) XP® Rabbit mAb #3633. KARPAS cell line source: Dr. Abraham Karpas at the University of Cambridge.